Was born about 1580, at Kipling, Yorkshire, England; was graduated at Oxford; travelled on the Continent; became secretary of Robert Cecil; married Anne Minne in 1604; was a clerk of the privy council; was knighted in 1617; became a secretary of state soon afterwards, and in 1620 was granted a pension of $5,000 a year. When, in 1624, he publicly avowed himself a Roman Catholic, he resigned his office, but King James retained him in the privy council ; and a few days before that monarch's death he was created Baron of Baltimore in the Irish peerage. Calvert had already entered upon a colonizing scheme. In 1620 he purchased a part of Newfoundland, and was invested with the privileges and honors of a count - palatine. He called his new domain Avalon, and, after spending about $100,000 in building ware-houses there, and a mansion for himself, he went thither in 1627. He returned to England the following spring. In the spring of 1629 he went again to Avalon, taking with him his wife and unmarried children. The following winter was a severe one, and he began to contemplate a desertion of the domain on account of the rigorous climate. He sent his children home. In the autumn he actually abandoned Newfoundland, and with his wife and retainers sailed to Virginia, where, because he refused to take the oath of allegiance, he was ordered away by Governor Harvey. His wife and retainers remained there during the winter. Going from there in the spring, it is supposed he explored the shores of Chesapeake Bay, and chose that region for a settlement. In 1632, Lord Baltimore obtained a charter from Charles I. of the territory on the Chesapeake now forming the State of Maryland. " What will you call the country?" asked the King. Baltimore referred the matter to his Majesty. " Then let us name it after the Queen " (Henrietta Maria), said Charles, " and call it Mariana." The expert courtier dissented, be-cause that was the name of a Spanish historian who taught that " the will of the people is higher than the law of tyrants." Still disposed to compliment the Queen, the King said, " Let it be Terra Marice—Mary's Land." And it was named Mary-land. Before the great seal of England was affixed to the charter, Lord Baltimore died, April 15, 1632, and was succeeded by his son Cecil. Second Lord Baltimore, was born about 1605. Very little is known of his early life. When he was about twenty years of age he married Anne, the beautiful daughter of the Earl of Arundel, who was one of the most influential Roman Catholics in the realm. On the death of his father, the charter for Maryland was issued to Cecilius, his eldest son and heir, June, 1632 ; and he immediately prepared to sail for the Chesapeake with a colony. When he was about ready to depart, he changed his mind, and sent his brother Leonard, as governor, with his brother George, and two assistants and counsellors, Jeremy Hawley and Thomas Cornwallis, both Protestants. The whole company, who sailed in two vessels-the Ark and Dove-numbered over 300, according to Lord Baltimore, who wrote to his friend Went-worth (afterwards the unfortunate Earl of Strafford: "By the help of some of your lordship's good friends and mine, I have sent a hopeful colony into Maryland, with a fair and favorable expectation of good success, without any great prejudice to my-self, in respect that many others are joined with me in the adventure. There are two of my brothers, with very near twenty other gentlemen of very good fashion, and 300 laboring men." As most of the latter took the oath of allegiance before sailing, they were probably Protestants. Father Andrew White, a Jesuit priest, accompanied the expedition. They sailed from the Isle of Wight, and took the tedious southern route by way of the Canaries. The vessels were separated by a furious gale, but met at Bermuda, whence the emigrants went to the Chesapeake, founded a settlement, and established a government under the charter, which was nearly the same in form as all charters then granted (see MARYLAND) . It conferred on the proprietor absolute ownership of the territory, and also the civil and ecclesiastical power of a feudal nature. En-tire exemption from taxation was con-ceded to the colonists. As an acknowledgment that the original title to the land was still in the possession of the crown, the proprietor was required to pay to the King the tribute of two Indian arrows. Cecil was a member of Parliament in 1634, but mingled very little in public affairs afterwards. He never came to America, but & managed his province by deputies forty-three years. His course towards the colonists was generally wise and conciliatory, because it was profitable to be so. In religion and politics he was very flexible, being quite indifferent to either, and he did very little for the religious and intellectual cultivation of the colonists. Negatively good, he was regarded with great respect by all parties, even by the Indians. 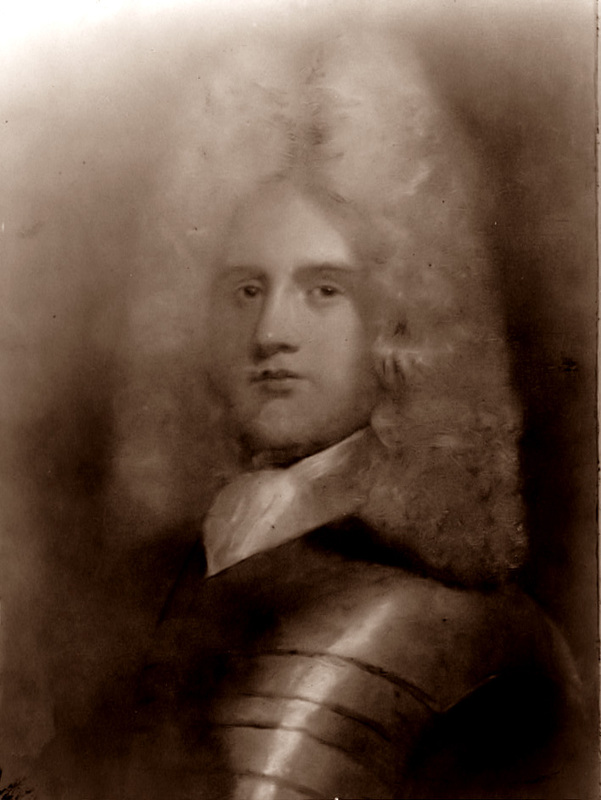 He died in London, Nov. 30, 1675.
third Lord Baltimore, succeeded his father as lord proprietor of Maryland in 1675. He was born in London in 1629; appointed governor of Maryland in 1661; and married the daughter of Honorable Henry Sewall, whose seat was on the Patuxent river. After the death of his father he visited England, but soon returned. In 1684 he again went to England, and never came back. He was suspected of favoring King James II. after the Revolution, and was outlawed for treason in Ireland, although he was never in that country. The outlawry was re-versed by William and Mary in 1691. 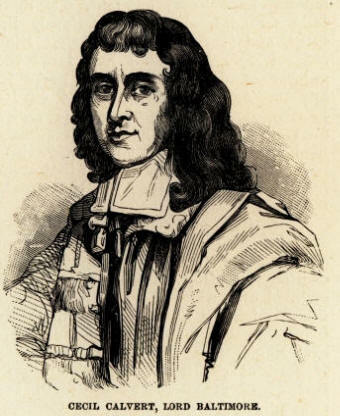 Charles Lord Baltimore was thrice married, and died in London, Feb. 24, 1714. Benedict Leonard Calvert was the Fourth Lord Baltimore, succeeded his father, Charles Calvert, in 1714. In 1698 he married Lady Charlotte Lee, daughter of the Earl of Lichfield (granddaughter of the notorious Duchess of Cleveland, the favorite mistress of Charles II. ), from whom he was divorced in 1705. Benedict publicly abjured the Roman Catholic faith in 1713, and died in 1715, only thirteen months after the death of his father. Son of Benedict, and the fifth Lord Baltimore, was born Sept. 29, 1699, and was an infant in law when he succeeded to his father's title. In July, 1730, he married the widow Mary Janssen, youngest daughter of General Theodore Janssen. His life was spent chiefly in England. In 1731 he was appointed gentleman of the bedchamber to the Prince of Wales, and soon afterwards was elected Fellow of the Royal Society. He was in Parliament in 1734, and in 1741 was appointed Junior Lord of the Admiralty. In the spring of 1741 he was appointed cofferer to the Prince of Wales and surveyor-general of the Duchy lands in Cornwall. After having ruled Maryland in person and by deputy more than thirty years, he died April 24, 1751, at his home in London. Sixth and lastLord Baltimore, was born in 1731, and succeeded to the title of his father, Charles Calvert II., in 1751. He married Lady Diiana Egerton, youngest daughter of the Duke of Bridgewater, in 1753. He led a disreputable life, and died at the age of forty, at Naples, Sept. 14, 1771. Yet he was a patron of literature and a friend and companion of the Earl of Chatham (Pitt). In 1767 he published an account of his Tour in the East. He was a pretentious author of several other works, mostly of a weak character. Lord Frederick bequeathed the province of Maryland, in tail male, to Henry Harford, then a child, and the remainder, in fee, to his sister, the Hon. Mrs. Norton. He left an estate valued at $5,000. The last representative of the Baltimore family was found in a debtors' prison in England, in 1860, by Col. Angus McDonald, of Virginia, where he had been confined for twenty years. Henry Harford was the last proprietor of Maryland.